In watchmaking, aventurine has swung in and out of fashion over the years. However, even though its use does seem a bit cyclic, I’ve never noticed it being used in anything but extremely rare occasions. So while many recognize the name “aventurine” and its distinctive look, it is not a widely known material in horology. Despite seeing aventurine in six new wristwatches at SIHH – more than the number of new tourbillons I counted! – it remains a decorative artisanal element used only by luxury watchmakers in small series or unique pieces for its beauty and decorative properties. Nonetheless, there remains some unclarity about what aventurine actually is, with watch brand representatives even claiming it to be a stone at times. Here is the truth about what aventurine really is and where it comes from. Aventurine was “discovered” by chance by Italian glassblowers in Venice in the seventeenth century, who discovered it “by chance,” which is the root of the name avventurina it was given. The original manufacturing license for it was granted at this time to the Miotti family by the chief magistrate (doge) of Venice. Though there is no documentation to support it, urban legends dictate that the material also existed up to 500 years earlier (and Wikipedia cites the existence of an amulet from twelfth-century Persia). A short history called Murano, its Glass, and its People edited by Stanley B. Kruger cites the earliest documentation of aventurine glass as 1626. However, journalist Yannick Nardin has dug out other possible origins as she writes in the HH Journal: she found out that according to The Oxford Companion to the Decorative Arts, the ancient Egyptians had already mastered making this type of glass. There it was also described that the recipe had been lost and revived over the centuries. Other sources, according to Nardin, also claim that the original “by chance” story was invented so as to keep the recipe a secret. The true origins of aventurine are apparently as murky as the glass’s color can be. Aventurine glass is made using transparent red copper ruby glass and a purpurin glass, which is brown to deep red in color. When cobalt is substituted for copper, the glass turns blue, creating the type of aventurine primarily used in wristwatches. The blue glass – which can also be green or most commonly golden brown, though I have never seen these used in watches – contain flecks of copper that shimmer like stars in a midnight sky. While it is beautiful, it can also be tricky to work with. Watch designer Georg Bartkowiak calls working with aventurine – a material he loves – a “surprise package,” citing inherent “inclusions” (especially of the green glass material) and its fragile nature as not always making it uniform. “And the bigger the piece, the more fragile it becomes. For a dial it should be thick to remain reliable,” he explains. Jean-Marie Schaller, CEO and creative director of Louis Moinet, loves to work with aventurine glass on his otherworldly creations. “We work exclusively with Daniel Haas, who is a master in this field,” he explained to me recently of his prized supplier. Is aventurine set to become rare? In her article, Nardin mentioned that production in Murano is “virtually at an end” due to harmful substances used in its manufacture that have now been banned. Haas did mention that he has already seen nice material from China that could be used instead of the Murano supply, but naturally clients of the caliber he serves prefer to use material that carries the mystique and traditional connotations of the Venetian island. And Nardin told me that she learned that the material is also stockpiled in Murano, so I’m guessing we’ll continue to see watches with aventurine dials for quite a while yet. A geological feldspar by the name of aventurine also exists. It was named after the glass and more commonly goes by the name sunstone. Orange or reddish brown in color, it glitters with sunny beauty. There is also a mineral called aventurine that belongs to the quartz family. More often than not it is green in color with metallic particles of fuchsite; it is most often used as cabochon-cut jewelry and is on occasion mistaken for jadeite. Measuring seven on the Mohs scale, it was named for its similarity to the sparkling glass called aventurine. While in the watch industry, the glass is far better known than the mineral stones, it is the natural stones – which are often used in healing, chakra, and jewelry – that most people are familiar with. Aventurine is called Goldfluß in German, which translates to “goldstone” in English. It is my firm belief that some confusion comes from the translation (as so often happens in the watch industry with various technical terms and jargon). Though this is not necessarily a mistranslation – Goldfluß literally translates to “gold river” – the word “stone” seems to have caused some puzzlement at times. However, “goldstone” is where Wikipedia lists the glass that the watch industry commonly calls aventurine. So go figure. It is not a commonplace element, but a number of watch brands have used aventurine in special and/or limited edition models over the years. Brands particularly love to combine it with white diamonds to show off the intense sparkle of both elements. The glass, which is not particularly easy to handle in the manufacturing and assembly stages, goes well with celestial themes, cosmic in nature, where it resembles a sky full of stars. Later, he recalled, his family-run company continued with aventurine dials for brands like Ulysse Nardin, Jaeger-LeCoultre, Bulgari, Audemars Piguet, and of course Jaquet Droz, with whom he has made a meaningful number of rare stone dials over the course of many years. It was also Haas who put the aventurine dial on the 1970s Omega Constellation Megaquartz Stardust – which also happens to be the earliest watch with an aventurine dial I have personally seen. This is a prime example of how easy it has been to add to the confusion surrounding the origins of aventurine. One of the most intriguing uses of aventurine at Omega is for me 2012’s Speedmaster Moonwatch Professional Aventurine because I find this particular juxtaposition to be . . . well, weird. I get what Omega was trying to do: put a “night sky” in place as a dial to emphasize the “moon watch.” But the mélange of sports chronograph and elegant aventurine glass doesn’t work well for me. And, truth be told, the stainless steel case doesn’t set it off the same way white gold and/or diamonds would have. In fact, I don’t think this model ever became popular. One of the very few references to it I’ve found online is a short article by Fratello Watches’ Robert-Jan Broer, who explained that many have thought this to be a phantom model. Broer also perpetuates the idea in the article that this dial is made of stone, which I can only assume he got from the original press release. Haas has confirmed to me that it is indeed the glass material. I became very intrigued by the idea of a brand using the real stone as a watch dial and wondered if anyone had done it before. My own research came up empty, at which point I asked our Martin Green, who holds a GIA certificate, if he’d ever seen one. After some research, he pointed out two instances to me. One he found was a vintage Rolex, which I was not able to find more information on. 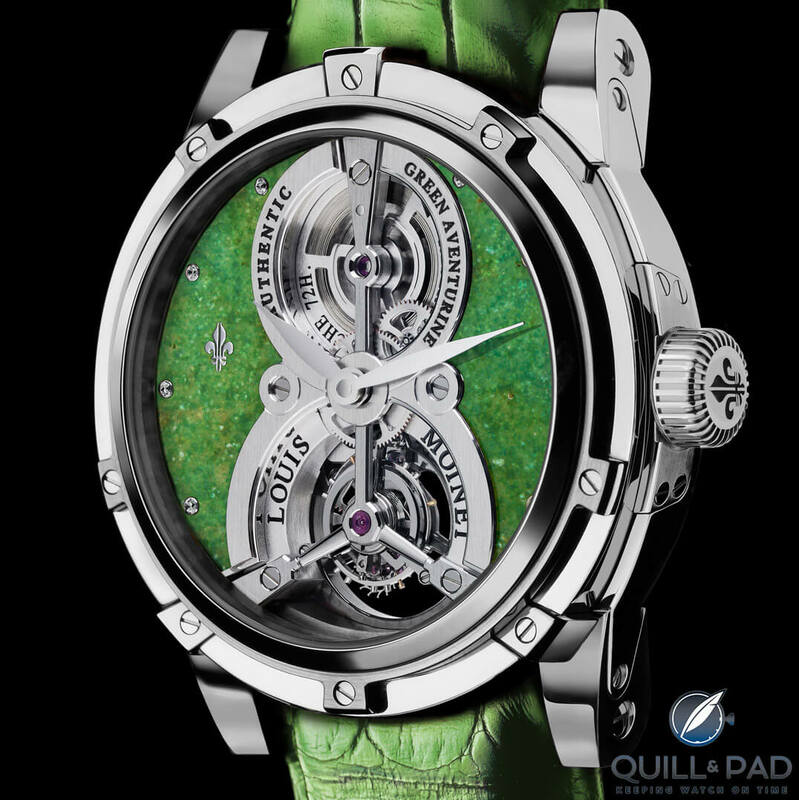 But the other instance is Louis Moinet’s unique piece Treasures of the World Green Aventurine Vertalis Tourbillon, which constitutes the only occasion that this independent boutique brand has used a natural aventurine stone. “The purpose of our Treasures of the World collection is to enable collectors to discover some natural stones that are not well known. Green aventurine is part of the mythical, beautiful, and mysterious stones that are little known by the public,” Louis Moinet’s Schaller explained during our aventurine conversation. Schaller was enamored of the beauty and strong color of the green aventurine stone, which Daniel Haas sourced and worked for use in this watch. Jaquet Droz has worked with Daniel Haas for decades on watches with unique and unusual stones. Haas is also behind the Swatch Group brand’s watches outfitted with aventurine dials – and there have been quite a few. Les Deux Fuseaux from 2009 is a good example of a complicated watch with an almost equally complicated dial. The aventurine used as the background has screws and cutouts requiring extra care in adding the glass material, which could easily break during drilling, cutting, screwing, and polishing steps. Keep in mind that the aventurine is first cut into slices that are 1.5 mm thick before it gets polished to become 0.8 mm and thinner to be added to a watch. The most unusual of Jaquet Droz’s use of the material is however certainly the trio of Sunstone watches introduced at Baselworld 2015. The Petite Heure Minute 35 mm gets a whole new look with the red aventurine dial, and the use of this particular model is genius in highlighting the infinite sparkles of the glass material with little else to distract. As this was a trio of Sunstone watches, there are two other equally beautiful examples: the Grande Seconde Cerclée, whose “infinite eight” formed by two interlocked dials is very carefully set upon the background of red aventurine, and a Lady 8, which becomes even more sensual, turning it into an exquisitely feminine jewelry watch. Unusually, Jaeger-LeCoultre brought out red aventurine in its Rendez-Vous Celestial that same year – hot on the heels of the Rendez-Vous Celestial with blue lapis lazuli that had come out in 2012 (see Serious Horology For Women: The Jaeger-LeCoultre Rendez-Vous Celestial). This watch in both iterations is one of my all-time favorites with its focus on both high mechanics and feminine sparkle in a more-than-wearable case for any wrist size. Jaeger-LeCoultre has also harnessed the magic of blue aventurine in other watches, but the one that really stands out as a masterpiece is 2014’s Hybris Artistica Master Gyrotourbillon, which features a skeletonized dial made of the material. I would not want to have been the artist working on that one! See more about the 12 incredible Hybris Artistica pieces in When Art Ticks: Why Jaeger-LeCoultre Is A Master Of Art And Mechanics. Christiaan van der Klaauw has been peppering its astronomical timepieces with aventurine since Daniël and Maria Reintjes took over from the independent Dutch watchmaker who was ready to retire. Daniël Reintjes likes to concentrate on the astronomical themes of the watches, which you can read more about in Visiting Christiaan van der Klaauw: To The Moon And Back! Using aventurine to make a starry sky background fits perfectly with these astronomical themes – which is just one thing Christiaan van der Klaauw shares with Van Cleef & Arpels, though not the only thing. In 2014, the boutique brand collaborated with the French/Swiss jewelry icon to create the Midnight Planetarium Poetic Complication, Van Cleef & Arpels’s most complicated and expensive timepiece to date (learn more about it in Astronomical Design: Talking To Daniel Reintjes, CEO Of Christiaan Van Der Klaauw). And for the 2018 edition of SIHH, the two companies collaborated again to release a very wearable 38 mm version of the Midnight Planetarium – naturally also outfitted with an unusually complicated aventurine dial. This is of course not the first time Van Cleef & Arpels has used the material – that began in 2008 with Midnight in Paris from the Poetic Complications line, which had been established shortly before that. Independent watchmaker Svend Andersen has used aventurine for dials on a variety of his timepieces in unique executions. Some of these include the “tactful” Montre à Tact and a minute repeater with moon phase, both of which make sense because of the large expanse of otherwise unoccupied space on their dials. One interesting use of aventurine I hadn’t seen before is 2006’s Grand Jour & Nuit, a highly unusual jump hour timepiece with separate arcs for the day and night hours. The minutes are shown in a separate subdial at the bottom. Andersen chose aventurine because of its ever-changing sparkle depending on how the light hits it. Bovet has been using aventurine on its watch dials since 2008, but 2017 was definitely a highlight year as far using this material was concerned. This was the year the incredibly beautiful Virtuoso VIII arrived to help celebrate Bovet’s 195th anniversary. Positioned within the Fleurier Grandes Complications collection, this timepiece illustrates how the brand elevates artisanal watchmaking to new heights. The Virtuoso VIII is also Bovet’s first timepiece in this collection to feature an inclined sapphire crystal, ensuring that the focal point remains on the flying tourbillon nestled among the intricate engraving and aventurine dial segments. Other notable Bovet watches that feature aventurine include the Récital 11 Miss Alexandra and the Amadeo Fleurier Rising Star. Parmigiani Fleurier began using aventurine on some of its watches in 2016, and the brand has wasted no time building a large collection with it – which points toward success with the design. 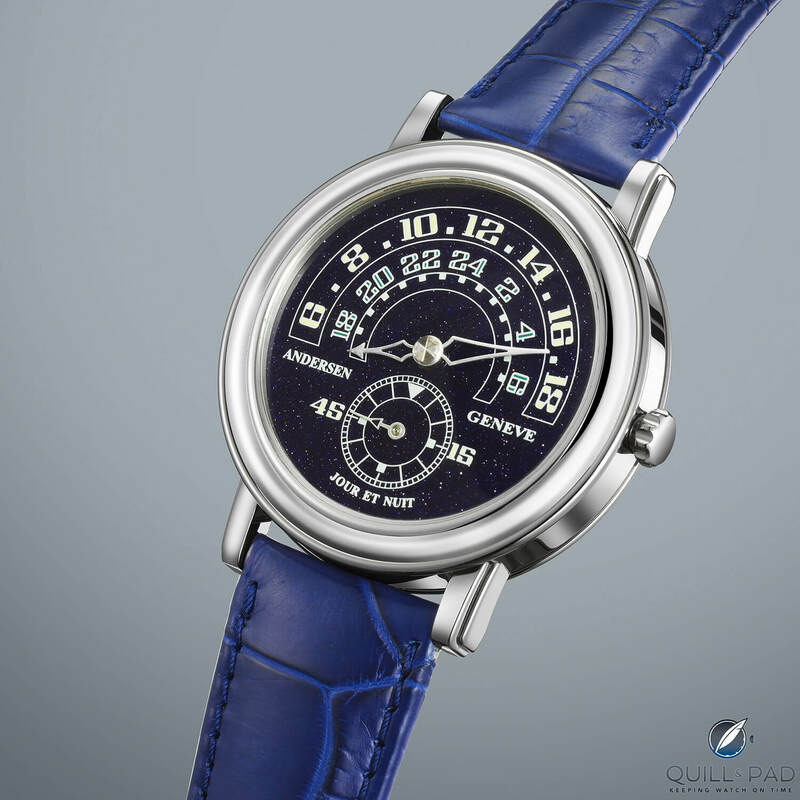 “Generally speaking, Parmigiani has been using the color blue for its dials for some time now. It is an elegant, discreet, subtle, and timeless color that is today for many brands, as for us, a bestseller in both men’s and women’s watches,” Flavien Gigandet, member of the brand’s executive committee, confirms. Today in the collection we find three rectangular Kalparisma Nova Galaxy models and five round Tonda models – including the complicated Tonda 1950 Tourbillon Galaxy – outfitted with the beautiful, shimmering glass material. See more on some of the brand’s new aventurine-outfitted watches from SIHH 2018 in Parmigiani Fleurier’s Kalparisma Nova Galaxy Featuring An Exquisite Aventurine Dial Is A Celestial Delight. Girard-Perregaux came out with a handful of aventurine-outfitted watches at the 2018 SIHH across two model families. But the Planetarium Tri-Axial Tourbillon is probably the most interesting of them in that it combines a very high complication with the sparkling glass. Unusually combined with a pink gold case not set with diamonds, I personally like it a bit less as the soft color of this gold doesn’t allow the glass material to sparkle as much as it normally would. But please tell me in the comments how you like the combination! Though it is not first time aventurine was used in the Girard-Perregaux Cat’s Eye line, the new 2018 collection from SIHH called Day and Night illustrates perhaps the most breathtaking use of the material. By combining it with intricate diamond settings of different sizes that really play to the oval shape of this special watch sets off the beautiful aventurine dial in a spectacular way. A. Lange & Söhne introduced a very surprising model at SIHH 2018: the Saxonia Thin with aventurine dial. It was so surprising because in its entire history, this brand has never used aventurine or any material even remotely like it. But using it on the Saxonia Thin was a stroke of genius: it became a watch to instantly fall in love with. See more on the Saxonia family’s history and development in Second-Row Stars: A. Lange & Söhne’s Saxonia Model Family. La Montre Hermès is known for occasionally doing something unusual and playful with its watches. The Arceau Pocket Iles et Ecailles with its scarab beetle marquetry is one such example. Delhotal also said that the objective of using aventurine was to have more reflection and brilliance on the dial and to give the watch a more precious touch. In that same year, Montblanc introduced a beautiful pocket watch with aventurine on the dial: the 4810 Villeret Tourbillon Cylindrique Pocket Watch 110 Years Edition, which you can read much more about in Montblanc Celebrates 110 Years With 2 Pocket Watches And Special Edition Wristwatches From The 4810 Collection. And just before that, the Heritage Chronometrie Exotourbillon Chronograph Vasco da Gama came out, also decorated with aventurine on the dial to symbolize the starry night sky that explorer Vasco da Gama used as a map to navigate and explore. See more about this unusually beautiful and complicated watch in BOOM! Montblanc’s Explorer-Inspired Heritage Chronométrie Collection. Aventurine is used sparingly throughout the collections of many watch brands, including Audemars Piguet, Bulgari, Chanel, Dior, Zenith, Ulysse Nardin, Piaget, and Boucheron. But keep an eye out for it as I’m sure this lovely glass will continue to surprise and delight watch connoisseurs for a long time to come. Fascinating article (which must have taken a lot of hard work to bring together). Thanks for recognizing that, Ian! You know, when I started writing I realized there was so much to this topic and it was just fun to keep digging! Aventurine is one of my personal favorites in terms of special elements. Thanks for compiling this article, it is a great read. Aventurine is truly a fascinating material. Seems like it may be pretty rare to get a hold of one of these time pieces. Thank you for the appreciation! They are pretty rare watches, but they’re out there. Great article Elizabeth! The green aventurine on Louis Moinet dial is gorgeous. Thank you so much, Yannick! I love that green aventurine dial too. You forgot Schaumburg Watch Company’s line of Moon watches. They use blue goldstone. Their Moon watches has the largest size moon phase of any watch. They are made in Germany. This listing is not exhaustive, so thank you for your comment.